Here we are again, only a couple months from that most American of celebrations, Independence Day. It's a wonderful time to celebrate the birth of our nation, to be thankful for the freedoms provided to us and remember the sacrifices made by the likes of Washington, Jefferson, Franklin and Adams. It's a day when we usually draw together as families and neighbors to share good company, good food, good weather (usually) - and fireworks. It's also a time when most of us adults hold our collective breath while our young ones play with safe and sane fireworks and, in some neighborhoods, some older ones fire off some that are neither safe nor sane. We silently pray that none of those glorious bottle rockets and roman candles end up igniting a neighbor's roof. As M80s rock our homes, we hope that no one loses an eye, hand or worse as they fire off that pseudo-military ordinance and flail around with those ubiquitous sparklers that I enjoyed as a kid, but that are now illegal. We hope our neighborhood pets don't suffer long-range emotional trauma from the explosions. We hope that everyone acts like an adult as they use the fireworks, but it's not always the case, as witnessed by this lunatic at a local fireworks celebration last year. Strapping a helmet with a fireworks launch-tube attached and running around with the fireworks flaring away is hardly responsible activity. 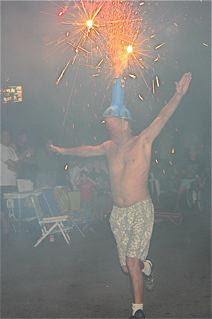 It is amusing - unless his pants catch fire or he ignites a neighborhood tree. Every year at this time the folks who are dead set against fireworks in our city rally their forces and try to point out the dangers. Every year those who support fireworks in Costa Mesa jump right up and defend the practice, saying that to outlaw them would be unpatriotic and would significantly deter youth sports organizations from raising funds for their activities. Every year our good friends a couple blocks away in Newport Beach skulk across the border into our neighborhood and shoot off their stash of fireworks, leaving our neighborhood streets a mess for someone else (us) to clean up. A few years ago we almost lost our home as a result of the careless use of fireworks, when a neighbor boy accidentally burned his garage down. Only the quick thinking of other neighbors headed off the conflagration before it reached our garage and home. At the risk of alienating every one of my neighbors, I must state that I'm one of those guys who thinks the City of Costa Mesa should abandon the sale and use of so-called safe and sane fireworks and replace it as a fund raising event including a municipal fireworks extravaganza. At the same time we should pull out all the stops to apprehend and punish those who use illegal fireworks in our city. Many people in town feel strongly that we should be allowed to continue to shoot off legal fireworks. They make eloquent arguments on the subject. They say we would be punishing the majority of folks who use fireworks safely for the transgressions of the few who don't. This issues is almost like trying to discuss religion... most people have their minds firmly made up and can't be swayed. I think there simply must be alternatives to the urge to explode things and raise funds for the kids. 90% of the cities in Orange County managed to do just fine in both areas without selling or permitting the use of fireworks within their borders. I love a good, professional fireworks show - I think most people do. Perhaps Mike Scheafer and his pals at the Lion's Club would re-schedule their Fish Fry for the July 4th time frame, hold it at Orange Coast College - with the rides and games and food - and have it topped off with a huge municipal fireworks display at the stadium. Proceeds from the events could be distributed to all the youth organizations presently benefiting from fireworks sales. This year, for example, with July 4th on a Friday, it could be a long-weekend event, with fireworks at LeBard Stadium on both Friday and Saturday nights. It's just a thought. I'd be very interested in hearing your views, whether you agree with me or not. As always, I expect courtesy when expressing a viewpoint and I will not publish anything submitted as "Anonymous" - pick a name, any name. I'm very surprised and disappointed, Geoff, that you resorted to using very graphic images to drive home your point about banning safe and sane fireworks. It seems to me these images aren't any different than Martin's tactic of publishing photos of Latino men grabbing their crotches and flipping the bird when he presses his illegal immigrant issues on his blog. It's sensationalism and emotional manipulation. How are we to know that the injuries you show were caused by safe and sane fireworks? Not a good call on this one, buddy. Byron, I understand your viewpoint. However, each year thousands of people, usually young people, are injured by fireworks. For example, in a report by the CDC it was stated that 10,800 people were treated in emergency rooms for fireworks-related injuries in 2005. Of those, 5% required hospitalization. 45% of the persons injured were children ages 14 and younger. Males were injured more than twice as often as female. In the month bracketing July 4th firecrackers (26%), sparklers (17%) and rockets (17%) accounted for most of the injuries reported. Sparklers were associated with more than half of the estimated injuries for children under five. The report goes on to say that more than one third of the fireworks-related deaths involved professional devices that were illegally sold to consumers. We've discussed this subject frequently in the past. I do understand your position. I was disappointed with the comparison you made, but if that's how you feel, so be it. I lack your literary skills, so used the photos to illustrate the point. They photos were taken directly from a site which used them as illustrations of the problem in a different city. There were others I did not use that were much more repugnant. I think it's possible to find a suitable municipal alternative to the sale and use of fireworks in our city and turning some neighborhoods into a war zone for several nights before and after July 4th. I do not want the loss of a child's sight, hand or life to be the impetus for us to finally do something. But Geoff, how many of those 10,800injuries were caused by safe and sane (legal) fireworks? You can't just throw statistics out there without context. In your third graph, you site injury percentages associated with firecrackers (illegal in California), sparklers (also illegal in California) and rockets (also illegal in California). So why is the solution then banning legal safe and sane fireworks? I suspect the injuries you site would actually go up if safe and sane fireworks were banned simply because of people then turning to illegal firework to continue their family/neighborhood traditions. The use of the images was just gratuitous, in my opinion. If they were caused by safe and sane fireworks, I might see your point for using them. Instead, you're talking about banning "oranges" and then showing pictures of the distructive effects of "apples". byron please to ask millard same questions when posting photos of latinos flipping thebird in a city other than the one he's trying to make a point about, or posting photos of barrios in venezuela, or posting pictures of graffiti from LA & elsewhere. Byron, at this link, http://www.nfpa.org/assets/files/pdf/os.fireworks.pdf, you will find the foundational report from which my statistics were snatched. It's a year old, 41 pages long and provides much to chew on. I invite you and other readers to review the information when you have the time. I'm afraid you'll have to copy and paste the link into your browser window. One of the interesting tidbits of information provided is that far more young children are injured by the "safe and sane" fireworks than other types. This is understandable, of course - those are the types typically handled by little ones. Your suggestion that the types of injuries shown on my entry would go up if safe and sane fireworks were banned assumes that there would be no substitute - to municipal fireworks extravaganza. I do not suggest banning fireworks in Costa Mesa unless there is such a substitute. You and I both know that, even if there is a fireworks show, there will be people who break the law and shoot off illegal fireworks. That's an education/enforcement issue that is not easy to resolve. Uh, we're not talking about White Supremacy, bigotry or racism here, cmtruth. We're talking about the misrepresentative use of photographs to argue a point. It's just not credible, in my opinion, to show a hand that was clearly blown to pieces by an M-80 or larger to make a case for the banning of legal safe and sane fireworks. Martin uses photos all the time to manipulate and emotionally amplify his argument. IMO, Geoff did the same here. Geoff is smart enough to make sound arguments without resorting to out-of-context gratuity. I too am a bit surprised by the graphic nature of your post Geoff. But on to the meat of the matter (OK, that was a bad pun). As fun as statistics are (and I say that as someone who REALLY enjoyed my statistics classes in school), human behavior is just as interesting. The motivation to celebrate, the motivation to be entertained, and yes the motivation to take risks are all a part of this little drama in Costa Mesa. I firmly support fireworks. Why? Because my family and friends have enjoyed fireworks at home my entire half century. Yes, urban density has necessitated some modification to our celebrations. Those modifications come by way of my family's interest in personal and public safety. We have always been sticklers for making sure fireworks were deployed in a way that did not endanger anyone or anyone's property. Young children were never allowed to deploy fireworks. Absolutely no one in my near or extended family has ever been the victim of a fireworks accident. Does that mean everyone is going to act responsibly? No. Punish those that do not. As for mitigating the risk of any behavior, including fireworks, keep in mind that you are far more likely to be offed by a drunk driver than lose your house to fireworks. If you are really into risk mitigation, let's go back to prohibition. No wait, that didn't work either, did it? Other salacious activities that have a higher than average rate of injury include one of my favorites, motorcycle riding. I will be the first to admit that the societal cost of motorcycle related injuries far exceed any beneficial byproduct of operating a motorcycle. I still have fun doing it. Are we to outlaw them also? Skateboards have to be up there somewhere as are bicycles, I am sure. Were do we draw the line? Real Christmas trees are one of my favorite examples of risky behavior. So if we agree that we can not legislate away risk, then the real question becomes where do we draw the line and why is that line being drawn around fireworks? It seems pretty arbitrary until we factor in how annoyed a certain percentage of our vocal population is with the noise and other nuisance factors. Are we really that cranky of a community? THANK YOU. You stole my thunder, and I will simply weigh in to endorse your post. Most everything is hazardous to our health. Peanut butter allergies are probably far more dangerous to kids than safe and sane fireworks. I ride a motorcycle, scuba dive and every year spend multiple days on a fishing boat 75 miles at sea. I regularly participate in shooting sports and have spent mornings dove hunting. I ski multiple times each year and spend weeks camping in the mountains. There are many possibilities for serious or fatal injury in every one of these activities. Should we ban them? NO. As I have posted previously, my street is full of legal, safe and sane fireworks displays. Parents supervise kids, and garden hoses, fire extinguishers and trash cans are prevalent. If I see a neighbor setting off an illegal firework, I ask them to cease and desist. If they don't, I call the cops. I'll admit that I like to kep close to home on the 4th, just to keep an eye on things in case some idiot lands an illegal bottle rocket on my roof. Byron is right on about illegal fireworks. Family and friends live in Newport and there are plenty of fireworks being set off all day and night down there. Banning legal fireworks will do little, if anything, to deter the use of illegal fireworks. Finally, I too am not pleased with the use of the photos. None of those injuries could have been caused by fireworks legally sold in Costa Mesa. Why show them just to score rhetorical points? I still think fireworks should go and sincerely hope I'm not proven right this year. Thanks Geoff, I can check your site again before and after meals without fear of, well... you know.